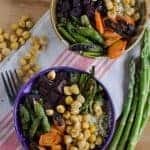 Quick and easy roasted chickpea and vegetable 1uinoa bowl is gluten free, meatless and full of vegetables. 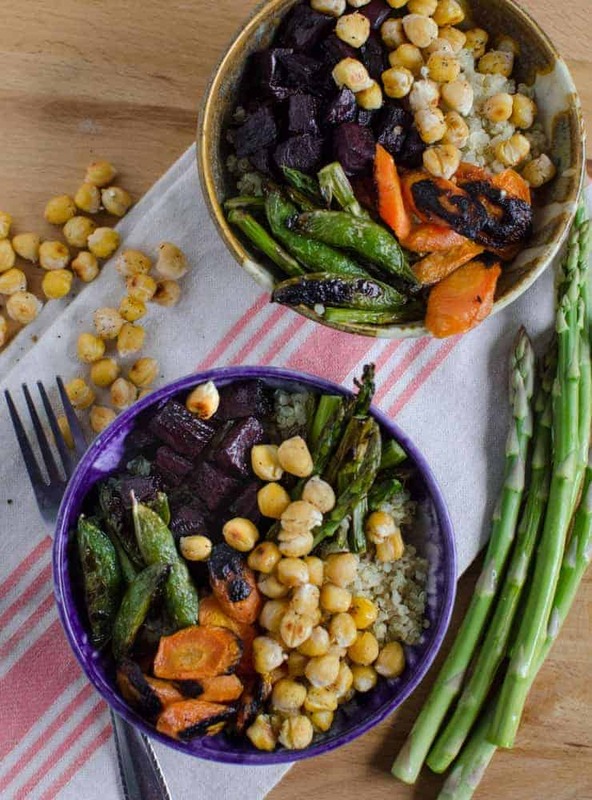 Have you heard of dinner “bowls” lately? 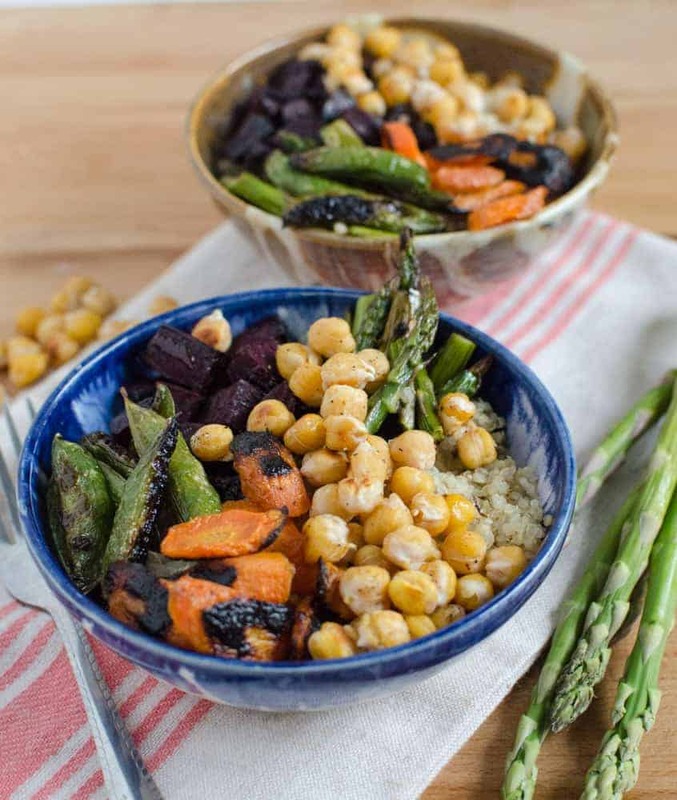 Well if you haven’t I’m here to let you in on the secret and share this simple and healthy Roasted Chickpea and Vegetable Quinoa Bowl recipe with you today. This dish is one of my favorite meatless meals and it comes together in a flash. You are going to love it! I first started making bowls a few years ago in the form of “burrito” bowls which are essential rice topped with all the delicious things you find in tacos/burritos. They are easy to put together and very customizable. 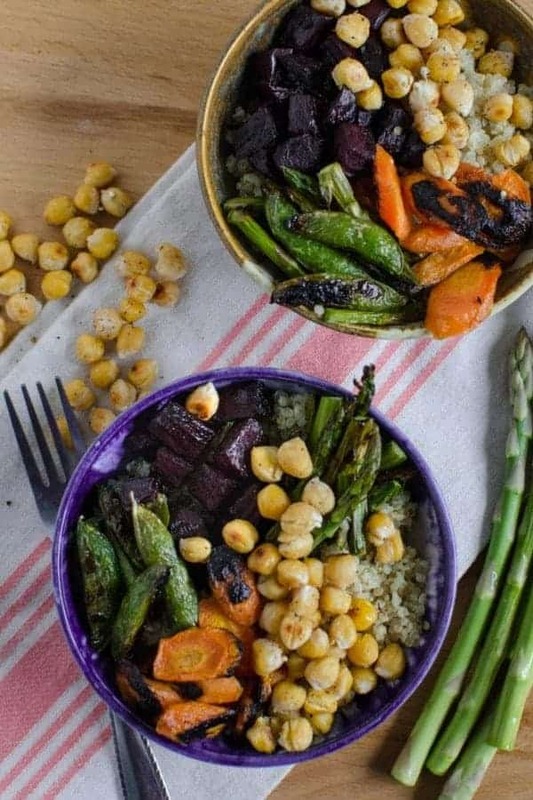 Recently I have seen a million recipes for roasted vegetable bowls and I have been making different varieties of these bowls over and over again. I think the idea behind the “bowl” meal is that it isn’t fussy because you are just adding everything to a bowl, it’s easy to eat, it’s simple but filling, and you can’t really ruin it. You end up with a little bite of everything once things gets all mixed around in the bowl and it’s delicious. I’m a big fan. My kids don’t really like this meal, so I’ll make the recipe as I have it written. I’ll eat one serving for lunch the day I make it and then I’ll divide up the rest into individual containers and reheat them later in the week for lunch. I love cooking once and eating a lot of different times. I like having some of these “bowl” options for lunch because having a simple, vegetable-based meal on hand and ready to go is awesome and helps me to eat well, but it also breaks up the salad in a jar rut that I get in often. Have you ever roasted chickpeas? I don’t love chickpeas normally (unless they are in hummus). I feel like the centers are a little too chalky for me, but when you roast them something magical happens. They get a little crispy on the outside and the insides get creamy and wonderful. I love them in this recipes. You can use just about any vegetables that you like, this was a good spring-time variety that I had on hand (this is also a great way to roast and use up leftover from your veggie box). How easy is that? You really can’t go wrong with something so simple, healthy, and filling. I didn’t love quinoa until I started buying the prewashed kind and then cooked it in chicken stock. It tastes a million times better when those two things happen. Feel free to make a bunch and divide it out for multiple lunches that week. It reheats very well! Don’t be shy with the lemon juice and salt and pepper, they are your only seasonings so you need to have enough of them. Do chickpeas have any health benefits? Chickpeas are high in protein, fiber and contain several key vitamins and minerals. Do I rinse canned chickpeas? Yes, drain and rinse chickpeas with water to decrease the sodium content. Rinsing them in cold water is said to make them easier to digest and less gas-producing as well. Place the chickpeas and the vegetables on a rimmed baking sheet. Drizzle with olive oil and then sprinkle well with salt and pepper. Roast in a hot oven until the beets and sweet potatoes are fork tender (about 20 minutes). Serve the roasted vegetables and chickpeas over hot cooked quinoa. Adjust the salt and pepper to taste and add plenty of fresh lemon juice before serving. It’s also delicious with a little hot sauce. Happy cooking, from my kitchen to yours! I do a beans and rice bowl about once a week–we put cooked brown rice, black beans, and then everyone chooses their own toppings (shredded cheese, lettuce, tomato, guacamole, salsa, sour cream, corn chips). Probably kind of like your burrito bowls? I love bowl meals, but like you, I usually so burrito bowls, and I get a little sick of Mexican flavored meals sometimes. So this is a great alternative. I am going to make lentils to go in the bowls too since I have one kid who can’t stand garbonzo beans. I am thinking some sauces would be really good with these, like Thai peanut sauce, or sweet and sour sauce, or even an Indian sauce, like Tikka Masala. Have you tried making spring rolls? They are my new favorite lunch. I make them with just veggies, or veggies and chicken, or veggies, chicken and rice noodles, and I just saw some with avocado in them that I need to try. I have eaten them every day for the last couple of weeks, and I’m still not sick of them! Here are 2 recipes that have good instructions and ideas. I always julienne my vegetables really thin. A lot of people make their veggies really thick, but I prefer them thin. You can really use whatever you want. I like red peppers, carrots, cucumbers, cabbage, and butter lettuce for the veggies. Cilantro and mint are a must for herbs. I despise shrimp in them, but that is a really popular add in. I love them with chicken and/or rice vermicelli noodles. You don’t use a lot of noodles, so 1 box would last you a long time. You would probably need to go to St George to get the rice wrappers, or order them. 🙂 Rolling them isn’t hard, just takes a little practice to get use to it. We are thinking a spring roll party would be really fun. Have everything prepped and then people can roll their own the way they like them. I use a glass pie plate to soak my wrappers, it is the perfect size. There is a Thai restaurant in Provo that has the best fresh spring rolls. But they can be really hit or miss in a restaurant, so I just make my own! I loved these! I loved them without any dressing on them. The veggies and wild rice had such good flavor on their own. But then I added Tikka Masala and it was AMAZING. So good. A new favorite! Yay!!! I’m addicted too and they reheat great… lunch all week! I just wanted to say thank you for this recipe. It has been amazing for my current eating goals. I have been adding some feta cheese to it and having some chicken on the side, and it is super good.